Two bills, one each in the House and Senate, have been introduced that would legislatively mandate a grant of Temporary Protected Status (TPS) to Venezuelans. They are, respectively, H.R. 549, introduced by Rep. Darren Soto (D-Fla.), and S. 636, introduced by Sen. Bob Menendez (D-N.J.), for which there is not yet a summary or text available as of this writing. Each has been introduced, needless to say, because Venezuela, despite huge oil and mineral resources, has become an economic basket case under the socialist rule of now-deceased Hugo Chavez and his protegé, bus driver-turned-president Nicolas Maduro. The misrule has led to inflation of staggering heights, and the denizens of a once-wealthy country have been reduced to hunger and poverty. 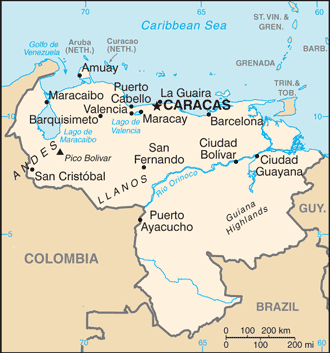 This in turn has led to social unrest and a contested election resulting in Maduro's "reelection", although the United States, much of Europe, and a number of South American nations have chosen instead to recognize his opponent, Juan Guaido. Meanwhile Maduro remains defiant of the international community, outside of a few close allies such as Cuba and Russia, and more recently Iran, and refuses to allow aid from the United States and other donors to enter the country from Colombia and Brazil, where tons of food and humanitarian supplies sit waiting for the OK. It's no surprise, then, that there has been a massive outflow of somewhere between two to three million Venezuelans (depending on who is making the estimates). Most of them have fled across borders into Colombia and other near-by countries, although those who can make it to the United States, often with previously obtained nonimmigrant visas, are seeking asylum upon arrival. It's against this backdrop that Soto and Menendez have filed their respective bills. There's some irony to two Democrats filing such bills given the strong leftward lurch of their party, which now includes self-avowed socialists. Sen. Bernie Sanders, though seated as an independent, caucuses with that party, ran in 2016 to become the Democratic presidential candidate, and in his bid to do so again in 2020 has signed a pledge that he is a Democrat. Sanders has been ambiguous in condemning Maduro for his dictatorial ways and calling for his ouster (see here and here), which is not surprising given his past fawning praise of the Soviet state, for which he was recently mocked by Sweden's prime minister. Rep. Alexandria Ocasio-Cortez (D-N.Y.) is also a socialist, perhaps even more extreme than Sanders. She, too, finds that the words stick in her mouth when someone asks her to condemn Maduro for the tin-pot despot that he is, even while firing constant blasts at Donald Trump as an autocrat and while arguing that past TPS recipients be granted amnesty. Consistency doesn't seem to be her strong suit. One may wonder why, instead of trying to create new law, Soto and Menendez aren't simply pushing the administration to announce TPS for Venezuelans under the conditions already laid out in the Immigration and Nationality Act, which can be found at 8 U.S.C. Sec. 1254a. The reason is that Sec. 1254a requires the foreign state to officially request TPS on behalf of its nationals, which just isn't going to happen given Maduro's flagrant anti-Yanqui machismo. There is an exception to this requirement when the Department of Homeland Security (DHS) secretary "finds that there exist extraordinary and temporary conditions in the foreign state that prevent aliens who are nationals of the state from returning to the state in safety." Note, though, that nothing in the law obliges the secretary of DHS to go that route, and it seems unlikely to happen for several reasons. First is that past grants of TPS to nationals of various countries have been outrageously abused, resulting in years and years — in fact, decades — of extensions by administrations of both parties, belying the "temporary" nature of the relief. As CIS Executive Director Mark Krikorian has remarked, there is nothing more permanent than a temporary alien. Second is that when this administration, recognizing the abuse, moved to end TPS for several nationalities, and did so in a generous way by phasing the programs out over the course of 12 to 18 months, it was promptly sued by litigants who cherry-picked the jurisdictions where they would file, to ensure favorable treatment by liberal progressive judges. Sure enough, a national injunction ensued, forcing the administration to perpetuate the programs while the cases wind their way through the appeals process. Third is that both advocacy organizations and a number of Democratic members of Congress have now introduced bills pushing for amnesty to grant these TPS recipients-in-perpetuity the right to obtain green cards and, eventually, citizenship. Finally we must consider that there is already a crisis on the southern border. The facts and figures make this clear, whatever liberals and progressives and alien advocacy groups may say. Granting TPS would only add to the already out-of-control situation when Venezuelans to decide to join the tens of thousands of Central Americans already headed north. What's more, it might encourage others in the region, such as Nicaraguans (whose own country teeters on economic and social instability — see here and here) to do likewise in hopes that their physical presence would encourage a similar grant of TPS. For an incisive recounting of the problems with TPS, I encourage readers to check out the congressional testimony of my colleague Andrew Arthur, which follows his remarks about DACA in the same testimony. The bottom line message is clear: Any grant of TPS, once made, becomes nearly irrevocable and results not only in resistance to termination when the program logically should end — which is to say, when the natural or man-made disaster that led to the grant in the first place is over — but increasing demands to grant another privileged group the right to remain forever. Given this ground truth, it is almost certain that the administration will find ways to support the Venezuelan people short of granting TPS. It is almost equally certain that even were the bills to pass through both chambers of Congress, go through reconciliation, and be presented to the president, he would veto anything placed on his desk. Why go along with the charade, where TPS is concerned? So what's the answer? TPS is sorely in need of reform. Some good bills have been introduced into past sessions of Congress that would amend the abuses that make the program so suspect and singularly unattractive. If either Soto or Menendez were to couple a grant of TPS for Venezuelans with honest language that adopted some of the best provisions in past bills, perhaps there would be room for compromise on the matter. Failing that, why would this administration shoot itself and all future administrations in the foot by creating one more special program for aliens who, instead of being thankful a few years up the road for having been given respite and succor, instead take to the streets like so many others have to demand the "right" to remain forever?